In case you missed it, Panic! 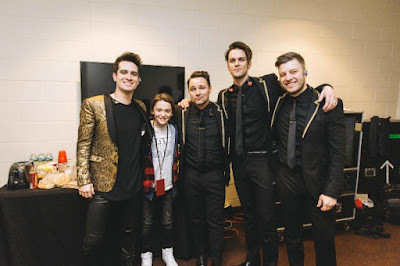 At The Disco was joined on stage by "Stranger Things'" star Noah Schnapp on March 2 at the iconic Madison Square Garden in New York City. Schnapp starred in the music video for the band's song "LA Devotee" last year, which can be found HERE. P!ATD is currently out on the Death Of A Bachelor Tour, a headline U.S. arena run in celebration of the success of their gold-certified firth studio album Death of A Bachelor. "Death of a Bachelor" debuted at #1 on the Billboard 200 chart last January and was nominated for Best Rock Album at the 2017 GRAMMY® Awards. The album is available now HERE via DCD2/Fueled By Ramen/Crush Music.